Prominent European leaders are pushing for a revival of the spirit of Charlemagne. In a November 17 interview with the Austrian daily newspaper Kurier, former German Defense Minister Karl-Theodor zu Guttenberg made a statement that ought to shock the world. He said that European heads of government should take a close look at, or follow the example of, Austrian Chancellor Sebastian Kurz. Germany’s government, especially Angela Merkel, is proving inadequate. For a leader with the right personality and leadership, this could be a terrific opportunity to seize control of Germany. Since 1982, the year E.T. the Extra Terrestrial was released and the Falkland War occurred, Germany has had only three chancellors. The United States has had five presidents in that time; Britain six prime ministers; and Italy 15 prime ministers. Even more remarkable: Since the end of World War ii, more than 70 years ago, Germany has had only nine chancellors. That’s an average of eight years per chancellorship. America, in that time, has had 12 presidents, six years per presidency; Britain 15 prime ministers, five years per prime ministership; and Italy 45 prime ministerships, averaging 1.5 years each. Behind these facts is a fundamental truth: Postwar Germany, perhaps more than any other modern nation, is accustomed to political stability and order. Europe’s refugee crisis is shaking Europe to its foundations. The shocks will help bring a new leader to power soon who will make a sinister deal with Russia. Every reader should closely watch what is happening in Germany. That nation is going through some dramatic changes that are about to reshape the country and the whole of Europe. Yet most of the world is asleep to how serious these changes are. German Chancellor Angela Merkel has never been weaker. In a very short time, she has gone from being one of the most popular politicians in the world to being the target of a lot of anger from the German people. The refugee crisis is precipitating a transformative identity crisis in Europe. You have probably seen footage of helpless refugees pouring into Europe. It can bring you to tears to see photos of drowned toddlers, pregnant women traversing dangerous terrain, and thousands of underdressed, malnourished children. But there is another important angle to this crisis that hasn’t received nearly enough consideration. This is the impact the refugee crisis is having and will increasingly have on Europe. Not just the immense financial cost, or the potential infiltration by Islamist terrorists, or the inevitable erosion of European culture. These consequences are significant. But something more fundamental, and more alarming, is unfolding. Europe is experiencing a transformative identity crisis. One of Germany’s most senior statesmen has ended years of political silence to warn the German chancellor that she must get a grip on the immigration crisis—and do it soon. German Chancellor Angela Merkel has until the end of March to change her mind about the nation’s approach to refugees or her position as chancellor could be under threat, according to one of Germany’s senior statesmen. “Angela Merkel must now change her position; otherwise there will be disastrous consequences for Germany and Europe,” he said. The world is becoming more dangerous than ever before. That’s the type of statement you may read in the newspaper or hear a presidential candidate say. But how to do you prove that it is true? One trend that gives us a good indication is military spending. In 2011, the world was spending more on its military than in all of history. We have remained around that historic peak in the years since, although military expenditures have shrunk slightly each year. The world is still spending more than during the Cold War, World War ii or any other time. The reason this indicates the danger in today’s world is not just as simple as saying, the more money spent on weapons, the more dangerous the world is. It matters who’s spending on it. And when you look at those facts, the picture is even more disturbing. 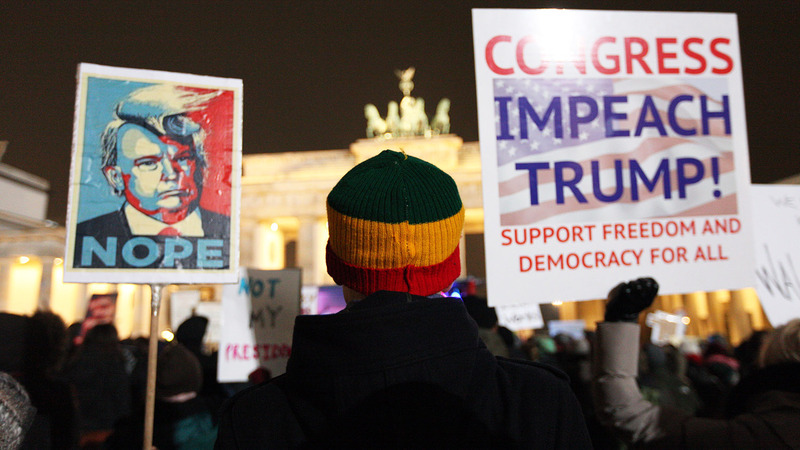 A spying scandal has sparked a lot of hatred for America among the Germans. Bible prophecy states that this trend will intensify. After World War II, Germany lay in ruins. The nation was wiped out economically and couldn’t afford to rebuild. The United States came to Germany’s aid with the Marshall Plan, giving billions of dollars to Germany and other European states to help them recover. This prevented Soviet communism from spreading into Western Europe, and it bound West Germany, and the future united German state, to the rest of Europe and the Western world. It also ensured a strong post-war alliance between America and West Germany. This alliance continued when Germany reunified in 1990. Recent events, however, are destroying this alliance. Germany’s strongman fires a shot across the bow of Vladimir Putin — and doesn’t hold back. What makes this article sting even more is that he teamed up with Garry Kasparov, the Russian chess master, who is also one of Putin’s most outspoken critics. In addition, another strongly made point when reading between the lines, is that he hinted that America has wimped out and no longer has the stomach to stand up for itself and face up to Putin’s political strong-arm tactics. Lastly, this article hints out that Russia has provoked Europe into filling the vacuum the United States has left behind in its retreat. Since Vladimir Putin’s official return to power in 2012, the Russian President seems to have set his mind on teaching the rest of the world a few simple lessons. First, that he shall not be underestimated on the international stage; second, that Moscow will keep reasserting control over what it considers to be its legitimate sphere of influence for Russia; and finally, that he shall do whatever he pleases at home. To convey his message, Putin has supported a murderous dictator, lectured the U.S. about multilateralism, blackmailed his neighbors into accepting Moscow’s ironfisted embrace, inflamed anti-American and anti-gay sentiments, and brutally cracked down on dissidents.